View from the Colligate Church of St Winifred (commonly known as Ripon Minster), including the south transept. The first ecclesiastical building here dates from the 7th century when Saint Winifred built one of the earliest English churches. The present church, the fourth to stand here, was built between 1331 – 1494. It is said to be one of the best proportioned churches in the country standing at 266 feet in length from east to west and 110 feet in height. The two towers are of equal height and each would have originally supported a spire. 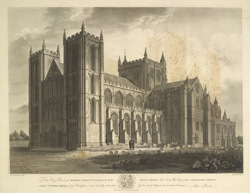 The Minster became a Cathedral in 1836 and was the first to be established since the Reformation.